Take a semi-barbaric children’s playground game and repackage it into a stripped-down online arena FPS that thrives on goofiness, and you’ve got Disco Dodgeball Remix. Actually, the game is really a repackage of a repackage, as this is essentially the tongue-twisting PC title; Robot Roller-Derby Disco Dodgeball with a slightly new coat of paint. The game manages to be a surprisingly enjoyable and quirky new take on the FPS genre overall, though this roller-disco party is not without its awkward and dull moments. 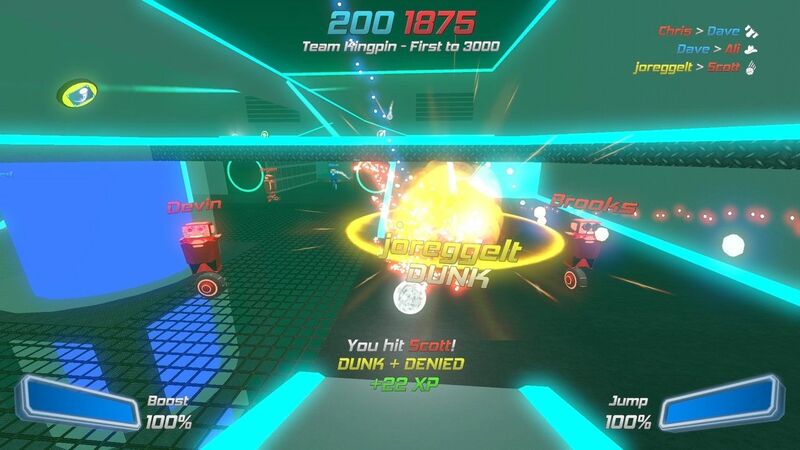 As Disco Dodgeball Remix features simplistic looking unicycle-legged robots rolling about a myriad of colorful neon environments, it becomes immediately clear that the game doesn’t take itself too seriously. Wacky, unadulterated fun and non-stop action is the name of the game here. As you’d probably guess, Disco Dodgeball takes on a heavy retro-disco theme that permeates the atmosphere. This is thanks primarily to its hypnotic thumping techno tracks and its vibrant indoor arenas containing plenty of psychedelic flashing lights. It’s pretty tacky and simplistic, but the uniquely charming art style manages to achieve a lot with a little. These squared Unreal Tournament-style arenas usually contain naught but a jungle of pillars, ramps, boosts, and occasional powerups like jetpacks and boomerangs scattered about. Then of course you’ve got the most important element; randomly spawning dodgeballs that you must scramble to pick up and launch at your robotic opponents. This is essentially your only form of ammo, and it’s not only limited, it can be quite tricky to fire off effectively. The concept of using a handful of dodgeballs as your only weapon adds an exciting dynamic and a distinct feel from what we’ve grown accustomed to in typical FPS’s. Much like the stripped-down aesthetic, there’s little depth or substance to it all, but the fast-paced, goofy nature of the gameplay lends itself well to the online play this game revolves around. Luckily, developer Zen Studios had the foresight to flesh things out with some single player features, for when the online lobbies inevitably thin out. A myriad of simple challenge modes populate the single player menus, each of which emphasizes a different ability, feature, or play style within the game. Most are simple and uninspired, but they’re a decent way to play around with the mechanics and help to hone your dodgeball game. They also come with their own online leaderboards, providing much needed incentive here. Some of these match types include Horde Mode, in which you shoot for a high score by fending off an infinite wave of bots, and a pinball mode that rewards you for ricochet kills - which is trickier to pull off than it sounds. There’s even a Time Trial Mode, which acts as a stripped-down racing game, as you must scramble through various laps of spawning checkpoints. This is a neat idea and a refreshing change of pace, though the stiff and often wonky movement and physics temper most of the potential entertainment here. The Arcade Mode exists as the bulk of the single player substance, and gets the closest to the online gameplay in terms of enjoyment. It exists as a sort of brief campaign with rogue-lite elements, as you must battle your way through a few waves of bots and the occasional boss. During your dodgeball romps, you’ll accumulate cash after each stage; the amount of which depends on the skill involved in your shots. Fancy shots like quick draws, mid-air hits, or long distance lobs, will net you more wealth, which in turn lands you greater rewards to nudge you towards a greater advantage. You can purchase buffs like higher jumps, faster boost recharges, and extra lives following each level. Unfortunately these rewards are only temporary; a frustrating feature considering the game’s grueling difficulty. Not only can aiming be tricky as you wrestle with some janky and stiff controls, but the annoying bots seem to have little trouble landing hits left and right, making defeat a near mathematical certainty. With only 5 lives total to work with, your run will likely end much sooner than you hoped. You can at least dial up the sensitivity, which should help your offensive effort somewhat, as it is set strangely low by default. If motion controls are your forte, the game makes impressive use of them on the Switch, though getting the hang of them does require some practice. Especially in a game like this, which demands swift and accurate movement, they will not be for everyone. Ultimately I fell back to the good old twin stick movement as they proved more reliable and precise, but Wii diehards might get a kick out of the gyroscoping controls. Another feature included, that will surely assist you in the heat of battle against the relentless bots, is the ability to take out a foe by catching a ball thrown at you. This is a key strategy to get out of a pinch when those pesky bots close in on you, though Disco Dodgeball’s oddly particular about this mechanic, and I found it difficult to nail down with consistency. Additionally, you’re thrown a sort of unified permanent xp system of progression, including mission points for notching various achievements throughout. These leveling systems work towards landing permanent upgrades, but most of them are merely cosmetic decorations that are meant for showing off to others in multiplayer, as you won’t be able to see them in first person. Still, it’s nice that you can build towards a unified pool of xp by playing around anywhere in the game, and this feature does help provide at least a small sense of rewarding gratification when playing. There’s also an interesting system in place that allows you to assemble bits of garb and flair through earned construction parts, which can in turn be deconstructed in order to build something new. As should be apparent by now, the online mode is where the real party is. While still far from a perfect FPS experience, I could tell that this is what the gameplay was tailor made for once I was swiftly thrown into my first match. You’re tossed in the arena with up to 7 other players, in either 4 v 4 or free-for-all matchups. This number sounds rather scant, but the confines of the small indoor environments allow for plenty of crazy and action-packed showdowns with 8 players. There isn’t much to say about most of the 15 or so arenas as a whole, as most are generic multileveled rooms decorated with pulsing neon lights. However, there is a colorful and more spacious stage reminiscent of Mario Kart 64’s Block Fort that’s worth a shout out. The level’s layout and aesthetic not only offered a refreshing departure from the more closed-in dance club vibe of most stages, but provided the most enjoyment in my experience, along with plenty of nostalgia. There is an impressive list of online modes which even surpasses that of the Arcade Mode varieties. 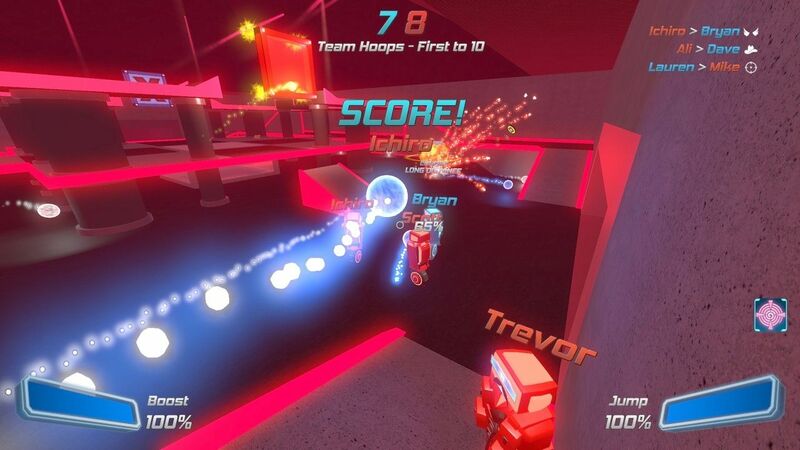 Among them are a gritty one-and-done elimination battle, a basketball inspired Hoops Mode, a capture the flag game where the traditional flag is swapped out for a cube, and a score battle that rewards points based off trick shots and stylistic hits. These come with varying degrees of enjoyment, though my favorites were probably the more fast-paced romps of basketball and Capture the Cube. They provided a steady flow of action and intensity, while containing enough depth to hold my interest longer than your typical dodgeball heaving deathmatch. Unfortunately, most of my matches were populated with more bots than people; a concerning metric considering Disco Dodgeball is still relatively new at time of writing. Still, the inclusion of the seamless swapping of people for bots helps mask the dullness of the lack of players, and should help make the game a bit more future-proof as the servers inevitably march towards near vacancy. Thankfully, a local multiplayer exists to further help safeguard against ghost town lobbies. The local multiplayer is fairly limited, but proved to be a good time in my experience, transporting me back to the simpler days of 90’s local FPS multiplayer. In an age where local multi seems to be going the way of the dinosaur in favor of online play, it’s refreshing to see a game that offers at least a sufficient platform for old fashioned local showdowns. 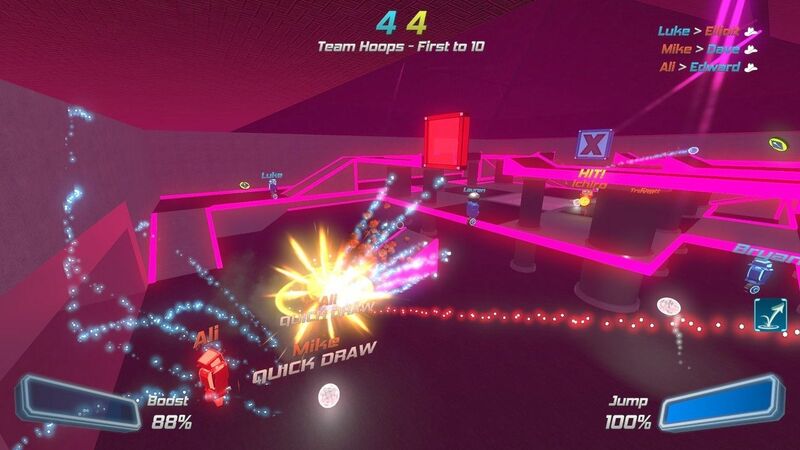 Disco Dodgeball Remix certainly isn’t going to turn the world of FPS games upside down, but it nonetheless offers an amusing and innovative take on the genre, while stripping things down and injecting a unique dynamic. The result is a decent online-focused shooter with a respectable arsenal of customizables, and an experience that feels both fresh and charmingly retro. At least while the servers are moderately populated - which probably won’t be for long - it’s worth giving it a shot. In true retro fashion, the game takes a bit of a dull, minimalistic and blocky graphical approach, but the vibrant, psychedelic lighting and banging techno tunes help bring the aesthetic to life. It manages to provide a simple background to the action that fits the gameplay like a glove. Floaty and stiff mechanics that take a little practice, but the simplicity of the gameplay and flexibility in the control scheme makes the game at least sufficient in this area. Environments are mostly uninspired but work fine for the wacky, fast-paced FPS gameplay they’re built for. The rogue-lite Arcade Mode and plethora of challenges are an admirable effort to provide some meat to the solo mode but mostly fall flat, thanks mainly to unfair bots and a lack of depth. There’s a nice rewards system in place but most short term unlockables are inconsequential aesthetic flair. The crux of the game’s enjoyment lies here, whether through the 2 player local battles, or the surprisingly robust and well-constructed online play. I found myself having a great time with most of the several modes included. Lack of players aside, this is the unquestionable highlight of the game. Overall a very smooth and solid performance in most key areas, even during the more heated moments in my online battles. 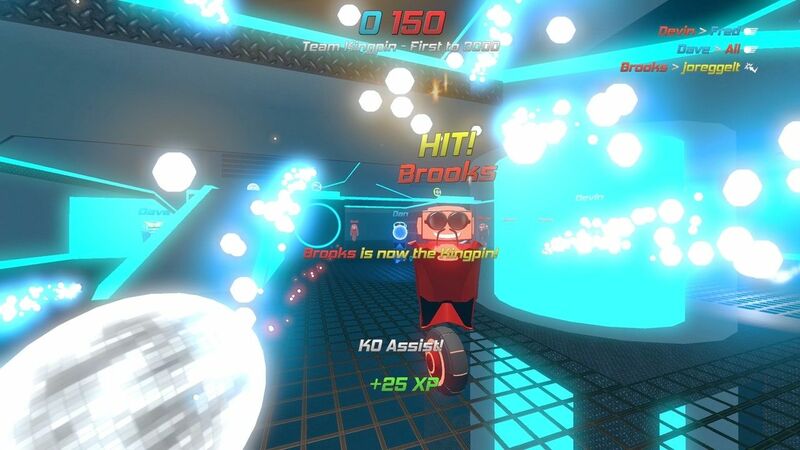 With a game both simple in its execution and deep in customization and unlockables, Disco Dodgeball Remix offers an interesting new way to enjoy online FPS gaming, at least in short bursts.